Be ready to ice away injuries or treat repetitive stress symptoms with the Pro Ice Pro Model Cooler Bag (PI 620). Simply freeze the cold therapy wraps ahead of time and place in the cooler bag. Carry the bag wherever its needed most: to the worksite, on the baseball field or the golf course. Then, when needed, remove the cold pack and begin to feel the non-toxic pain relief that Pro Ice brings. Treat any number of injuries, including acute injuries, ankle sprains, repetitive throwing motion injuries, carpal tunnel problems, pulled hamstrings, back pain and many other issues wherever, whenever needed. 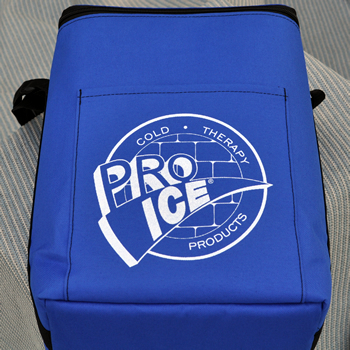 The pro model cooler bag holds up to eight standard or pro-sized wraps, providing extended relief or a team solution.